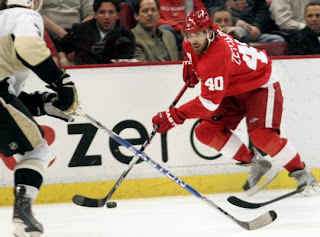 The Detroit Red Wings defeated the Pittsburgh Penguins 3-1 at Joe Louis Arena Monday night led by a 3 point night from Henrik Zetterberg. Zetterberg had two goals and an assist, making him a part of every Detroit point scored in the game. Detroit's first goal was scored by Valtteri Filppula with less than 1 minute remaining in the first, and the Pens could not overcome that momentum surge for the rest of the game. Zetterberg would get his first of two midway through the second beating Fleury on a backhand. The Pens appeared to be coming back, however, as Pascal Dupuis shot a puck on net which featured much movement by Chris Kunitz to screen the goalie. (The goal was initially credited to Kunitz, but it was later changed to Dupuis) Regardless who scored it, it put the Pens within one at the second intermission. The Red Wings would come out strong to start the third, as Zetterberg again beat Fleury this time on a long wrist shot. Detroit then settled down and was content to play defense against the Pens to preserve their win. The Pens had trouble generating any sort of attack throughout the game, as many of their 27 shots were off balance or from bad shooting areas. Detroit's Jimmy Howard also made several good saves to deny the Pens. Despite the loss, it was still a strong performance from Marc-Andre Fleury, who made 30 saves after receiving very little support from the rest of his defense. The Pens will look to rebound Wednesday at the Verizon Center against Alexander Ovechkin and the Washington Capitals.